“Oh Captain my Captain” was a quote I came to know from the movie Dead Poets Society. Robin Williams you truly were a captain for so many. I was blown away today when I, like so many, heard the news of the passing of Robin Williams. Every movie I watched of his since I was a kid came rushing back in to my head. I was one of the lucky people that was born in to a world with Robin Williams on the big screen. He was a part of my life at so many moments. 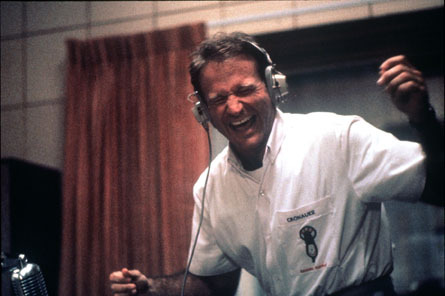 I remember as a kid watching the movie Good Morning Vietnam over and over and over. He brought such a enthusiasm to the screen! He was so full of life his character was exactly who I wanted to be when I was a grown-up. I really thought that Robin Williams was like he was in the movies in real life. It was easier to imagine him as this happy go lucky guy who never had a problem or care in the world, a person who lived to make us laugh till we peed our pants. Then I started to see myself what people like him and I were really like. I would go to school and be the class clown, make everyone laugh and just really act the fool. No one would have ever guessed that I was hurting so bad on the inside. When I left school I went home to an abusive house hold everyday. Getting hit for the littlest thing, always being scared, on top of that I was just starting to realize that I was gay and worst of all the feeling of being unloved. School was an outlet to feel like I was someone else. I became an actor in a sense and I have really kept it up my entire life. I think Robin Williams suicide has affected me so much because I am so much like him. Making people laugh and be happy and even when I am feeling really down I never tell anyone I mask it with a smile I make it seem like nothing is wrong. When will we finally start talking about depression and other forms of mental illness. We have lost so many wonderful people to depression both famous as well as our friends and family. We have all been touched by depression in one way or another. We need to start talking to each other when we hurt, we need to show empathy to others so that they feel worth and loved. We need to Validate one another so we all feel our importance in life. I am on a pill that is used to help with depression and mood swings. I wish I would have gone on it years ago it has changed my life for the better that is for sure. I used to think like so many others that I don’t need to take something to make me feel good I can deal with it on my own, if that was true then why was I like that for so long? Sometimes we just need a little help. If you had cancer would you pass up on radiation and say you could do it yourself? If you had schizophrenia you would need to take pills to keep it at bay. Be honest with yourself you sometimes you can’t just wish something away, sometimes we just need help. When people like Robin Williams Die from something like addiction and depression it gives us all a chance to talk, so lets talk. If you have been through depression help someone going through it now. If you are going through depression now reach out to someone for help.